Never before has any design incorporated all of DMC's 390 solid colors, blended together to create such an overwhelming amount of clarity and detail. Most of us have all the floss colors in our collection. 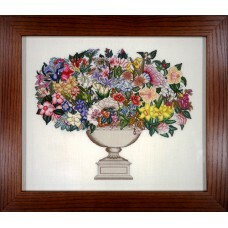 Now you can stitch them all into this lovely "Les Plus belles Fleurs" ......the most beautiful of flowers! The model is stitched with DMC floss on Zweigart linens. You may certainly use the fabric of your choice and for your convenience a floss conversion chart from DMC to Anchor floss is also provided. Allow the charm of these "most beautiful flowers" to grace your stitching basket. Certainly this design will afford you years of stitching pleasure, as well as a magnificent heirloom to cherish for generations. Much pride and satisfaction are presented with Maureen's masterpiece. A heartfelt manuscript prefaces this chart-pak, indulging you in her French experience with this proficient embroidery floss manufacturer. 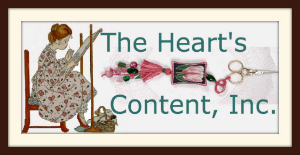 All The Heart's Content, Inc., Inc. designs are stitched with DMC flosses, and finally the culmination of several years of endeavor has closed with an undiminished presentation! Floral Afghan is a beautiful collection of flowers from my gardens. You can stitch these individuall.. The Heart's Content, Inc. presents its fourth Chart Pak. Introducing the new Children's Series. Comp..
I’m tellin ya, when I became YaYa in 2009, my entire world stopped for a moment, and the real meanin..
With the birth of The Heart's Content, Inc. in 1984, Flossie has been the registered copyrighted tra.. This design is stitched on 40-count linen and can certainly be stitched on your choice of fabrics wi.. This charming sampler is stitched on 40-count 18th Century Stone hand-dyed linen, and fits in our tr..
Biscornus have certainly earned a special place in our stitching nests today. I’ve created this one ..